This podcast is sponsored by SCOPE, an amazing organization that helps to send children from financially disadvantaged families to summer camp. You can learn more about SCOPE online and through social media @supportscope. As camp directors and parents, we have been talking, researching, and writing about gratitude for the past decade. Practicing gratitude leads to so many positive outcomes, it’s hard to understand why it’s not taught more in schools, camps, churches and online. We want to help change that. Secondly, I’m excited to have two of my favorite people around the campfire with me – my good friend Dana Stassen and my bride, Kate Kelly. Dana Stassen is a proud graduate of the University of Maryland, earned her Masters of Education in Reading Education from Towson University, and is a former classroom teacher with some pretty amazing stories. For the past several years, Dana has been sparkle-inducing Assistant Director for Camp Weequahic where she helps hire and train staff, plan all of our evening activities and special events, and create amazing for everyone she meets. Most importantly, she’s mom to Carter and Kennedy and bride to our producer, Scrappy. 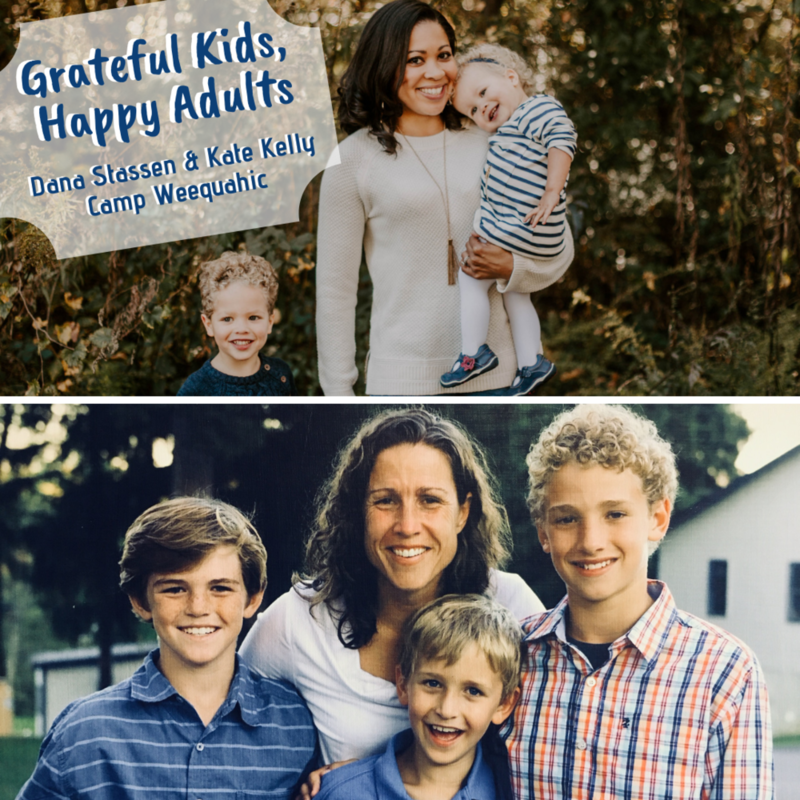 Kate Kelly is just ‘wicked smaht.’ A graduate of Dartmouth College where she captained the women’s soccer team, Kate worked at a top boarding school in admissions, running a dorm, and coaching teams for a few years while also spending her summers at camp. Kate later got her Masters of Education from Hah-vard and has been running summer camps for the past seventeen years. Mom to three rambunctious, wonderful boys, Kate is a deep thinker, founder of OneInchCloser.com, an amazing camp director, and a person who makes me better every day. These two have spent a lot of time thinking and experimenting on how to best instill the practice of gratitude in their own lives and the lives of young people. I’m excited to have them around the campfire again with me and hope you’ll enjoy our conversation. Gratitude Hacks is a wonderful podcast with a number of actionable ideas. Take a listen! Thanks a Thousand by AJ Jacobs is a worthy read. First of all, AJ is really funny. Secondly, the book is full of good ideas on practicing gratitude and the results from doing so. Finally, if you want to learn more about your daily coffee habit, this book is for you! Dr. Brene Brown’s Gift of Imperfetion is one of her many great resources. You can learn more about her through her blog, website, or watch the wildly popular Ted Talk that started us on her path. You are a Badass by Jen Sincero. Dana didn’t mention the book title - hey, kids could be listening! - but she did talk about some of the book ideas. I, Pencil is a really interesting read. Similar to Thanks a Thousand, it explores the making of a simple, every day pencil. It’ll open your eyes a bit to everything else around you and, hopefully, instill some some gratitude in the process. Here’s a great list of ideas on how you can get your teens going with the habit of gratitude. Finally, I mentioned a story about a student losing a lot of points on a final exam because he did not know the cleaning lady’s name. Two nights ago, reading something totally unrelated, I found the story. Sign up with your email address and you’ll never miss an update from around the Campfire. We respect your privacy and won’t sell, rent, share, or do anything untoward with your info!